The figure above summarizes the content of a 2005 paper by Paul Carlile and Clayton Christensen, The Cycles of Theory Building in Management Research. The authors propose a model describing an overview of the various elements and stages in theory building in management research (although I believe it is applicable to social science at large). 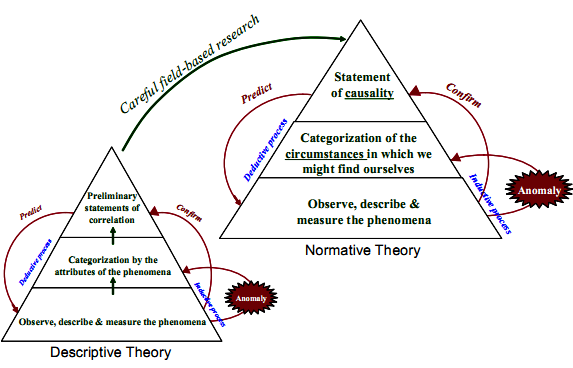 Carlile and Christensen show how different types of data and methods contribute to the process of scientific theory building. Their paper describes a three-step process by which researchers build theory that is at first descriptive, and ultimately normative. Then, it discusses the role that discoveries of anomalies play in the building of better theory. Finally, it explains how one can evaluate and use published theories. I think the article is interesting and useful. You can read it here.